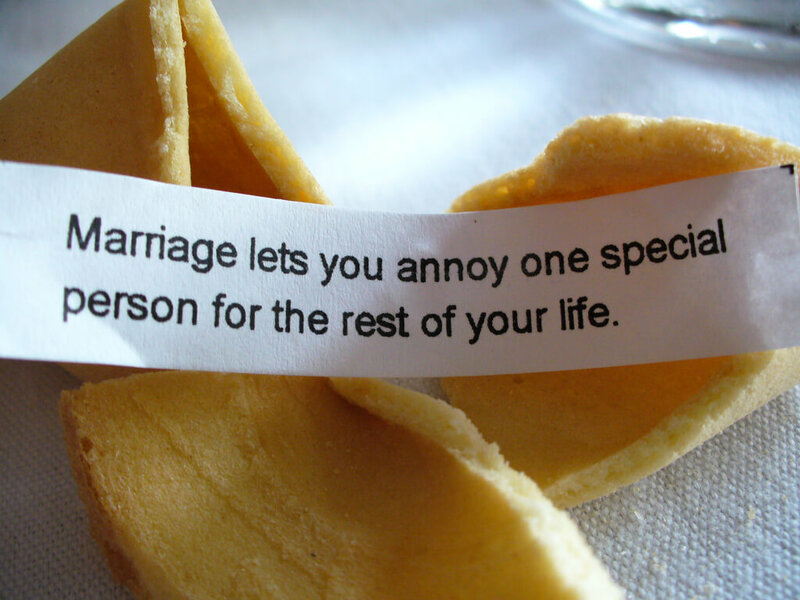 Advice Home > Marriage > What Are Some Cute Marriage Quotes? Marriage can be a rocky road. Anytime you have two people sharing something, there are bound to be disagreements. Sometimes it can be hard to express things you're feeling to your partner. Many people use song lyrics and quotes to get their points across or because they're not very good at explaining things in their own words. Quotations can also be used to support your point of view during a disagreement or to illustrate your point further. It's important to remember that quotations need to be taken in context as well, and sometimes paraphrasing for your own purposes means that your quote has nothing to do with what you're trying to convey. We all want to be happy, and sometimes marriage is the best way to express your love for each other. Thankfully our modern society accepts so much more than traditional marriage as an expression of love. Love doesn't have to be confined, and marriage doesn't have to be confining. With Valentine's Day being right around the corner now is the perfect time to brush up on quotes about love and marriage. Everyone has heard the big cliché quotes, the ones that are always coming up on Pinterest printed on cushions and signs, the ones that appear on chalkboards with people's engagement pictures. Explanation: Every day we have to choose to love the person we're with over someone else who might enter our lives that is better looking, richer, funnier, etc. To keep a marriage going you have to constantly make an effort or do a thing to make someone fall in love with you again. Explanation: Marriage is a partnership. Traditionally, men would be in control so if a man was unable to support his wife the marriage would inevitably break down. 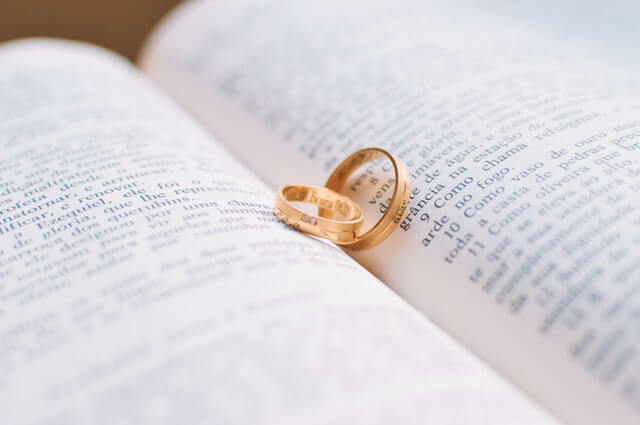 While times have changed, many women still take the secondary role, following their husband, so it is up to the husband to steer the relationship properly if this is the case. Explanation: We all feel that we don't deserve our partners on occasion. Sometimes, we do things we're not proud or-or we act a certain way that makes us less of a person. Self-love is important, but being loved by someone we trust is often more believable and will lift us up better. The spouse is in the ideal position to do that, and there's a certain awe that someone with so much power chooses us even in the bad times. Explanation: Many religions see marriage as the joining of two spirits together. Especially when couples are very much "in sync" with each other, it can sometimes seem like they're one person in two bodies. Movie culture and Hollywood often idealizes marriage. In many cases, the relationships we see on screen affect our own. We want to be as happy as the people we see so we try and copy their speech, their actions, their approach so that our own relationships can reflect theirs. Explanation: We often get caught up in the physical reminders of love (flowers, chocolates, etc.) without taking a step back to remember that love is something intangible that is felt rather than seen. Especially in a world where social media is so important sharing pictures of gifts has become a replacement for real, indescribable feelings. Explanation: Perhaps not the most useful, but when you're in love, you do tend to see the love in everything else. It's often called looking at the world through "rose tinted glasses" because you want everyone to be as happy as you are. Explanation: Many religions believe that marriage transcends death. If you have beliefs that love and marriage are really "forever" then you have to believe that this includes the physical body has moved on, and the spirit remains? Explanation: This goes back to the idea that a person is incomplete without being married. While the idea is supported by many religions, modern marriage sees things a little differently. It's still cute to think that you're both two halves of a same whole though. Explanation: Not all marriages are good. Sometimes they don't work, but, many people just give up as soon as there's a problem without wanting to get through the bad times. This is a reminder that sometimes a marriage not being perfect isn't the worst thing you could have. Today's ideals of marriage are more flexible than most of the religious and traditional interpretations. While some people still believe in the religious definition, we no longer see marriage as a submissive institution for women. Women are no longer chattel and instead are equal partners with their own thoughts or rights. Modern marriage has become about sharing and the uniqueness of the two people in it. Explanation: Sometimes we need to care about the other person more than ourselves to show them how valuable they are. When you're in love, there's a lot of sacrifices involved, and you tend to value the other person above yourself in every way. Explanation: Traditional marriages often seem regimented and stuffy. The younger generation, geared more towards a relaxed attitude, sees marriage as fun instead. What's more fun than sharing your life with someone you care about? Explanation: All marriages are unique because the participants are all unique themselves. This means that every marriage is special and should be cherished. Rather than comparing to other marriages and feeling dissatisfied, compare only within the marriage because there will never be another like it. Explanation: Every marriage has problems, but it's able to overcome those problems and differences and still want to be together that makes things work. Everyone struggles to find the right words sometimes. We know what we want to say, but we just can't quite get it out. Using a quote like this to express your love (or as a great come-back when you want to tell them that you still love them, but they're a twit) is an easy way of wording how you feel without having to think about it. Explanation: The term "soul mates" is pretty common when talking about marriage. It goes back to the old idea about two bodies and one soul where the souls are fated to be together. It's a nice idealistic view, though there's not much science behind it. Explanation: Many people still ascribe to the idea that marriage completes you. By being married, this person feels they have reached the pinnacle of life and didn't need anything else. Explanation: Sometimes men get criticised for being overly sensitive or showing too much emotion within a marriage. However, often women need this from their husbands to feel secure and to feel like they're loved. This is the perfect come back for anyone who tries to tell you that your marriage is weak because of someone being emotional. Every relationship has its rough days. When things get bad, it's tempting to throw in the towel and simply give up. There's a lot of reasons why a marriage might fail, and some of these can be useful when trying to figure things out. If you're struggling with your marriage, it may be a good idea to go to counseling. A counselor, like those at BetterHelp, can act as a moderator and allow you to discuss your issues within a safe environment without judgment. Explanation: One of the most common reasons people break up is that they feel ignored by their partner. Complacency kills relationships and ambivalence is a form of neglect when it comes to love. Without nurture and attention love with wither and die. Pay attention to your partner. Explanation: Many people marry because they desire their partner. We love them for many reasons, but that doesn't make us happy. We choose to keep friends in our lives because we enjoy them, so by enjoying your partner as a friend as well as a lover we are more likely to have a successful marriage. Explanation: Everyone makes mistakes, everyone does things wrong. It's simply human nature. Over time, those instances can build up and wear on a relationship so being able to truly forgive someone for things that are in the past makes it much easier to continue building forwards or eventually the weight of those past transgressions will crush a relationship. Explanation: Sometimes, you want to keep your partner no matter what. Especially when a marriage is breaking down people try all sorts of tactics to try and trap their partner into staying. Just because your partner seems trapped, they're not necessarily happy. It's the idea that someone who is happy won't leave and doesn't need to be forced to stay. Explanation: We are all guilty of blaming our partner within a relationship even if realistically what we're blaming them for isn't necessarily their fault, we simply don't want it to be our fault. 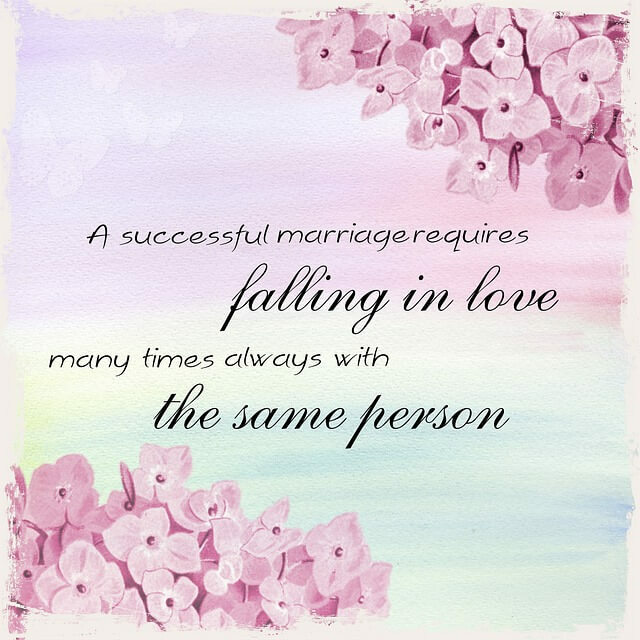 Marriage as a partnership means you should both want the best for the other and for that person to succeed. It's not a competition, and one-upping each other means you're putting the other person (who you're tied to) down. It's not logical, but it's surprising how few follow this advice especially when disagreeing.